We have a flow chart that our pressmen use and I would like to share it. 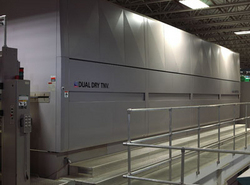 We use it for troubleshooting setoff on our offset printing press. It starts with the simplest solutions and gradually goes to the more difficult. Of course you really have to be able to examining the setoff to understand where it’s coming from. However, here is our list of solutions for solving problems with setoff which usually puts us in the right direction. First of all, we define setoff as any ink or combination of ink and paper that remains on the idlers, nips, former board or chopper table on our heatset printing press. On our sheetfed presses it takes on an additional dimension in that marking or smudging is accompanied by setoff. Bustle wheels can cause setoff. I start with this since it’s probably the easiest fix. If our bustle wheels are not lined up properly, they will cause setoff. Often we don’t realize it because the web is bouncing off of them and disguising itself as something on the angle bars or former board. Always be mindful of their position. Additionally, on our heatset press we have a superstructure that consists of several angle bars and a former board. Both require an adequate amount of air as they are friction points. We apply silicone to help, but air flow seems to have the greatest influence. Ensure your air flow pressure is sufficient. Control setoff with a heatset dryer. If we run very heavy coverage on our heatset press through the dryer at full speed, we have found that setoff can occur if our oven temp is either too high or too low. Too high and we will get chalking. Chalking happens when ink is cooked so much that there are no longer left any binders to hold the pigment in place. Therefore it deposits itself in different places. Placing your hand on the web while it’s running will reveal this. If oven temperature is too low, well the obvious occurs. Dark setoff will be everywhere. Ink must set in order to “dry” properly. We set our chill rolls to that the web exits at about 72 degrees. I have read that his is within the industry standard for heatset printing. If you go much lower, condensation happens, causing drips and web breaks. Too high and the ink will not set properly, causing setoff. On our coldset presses, we have many grater rollers that we have to change regularly. Depending on the ink coverage, they get dirty. We have found that if we run our blacks a little too high in density, these rollers get plugged up fast. Our solution? Keep the black densities as low as possible while maintaining good solids. Additionally, we make sure we do not go too long without replacing them to that the points on the grater roller do not get too dull. One of our presses has a re-moistening system. We had terrible setoff problems on our press until we found the cause. Our re-moistening was using soft water. It had a very low water hardness. The problem was that it was breaking down the calcium carbonate out of the paper and leaving it on the idler rollers. re-hardening the water fixed the problem. We do not know all the sources of setoff, but those are real-life examples that I share. I hope they help you in your pressroom. If you have any others, please feel free to share them in the comments.